Explores how chemists map chemical instability onto molecular representations and the associated temporal aesthetic of such representations. Reference the essay: Spector, Tami I. “The Molecular Elusive.” In Leonardo Electronic Almanac 22, no. 1, edited by Lanfranco Aceti, Paul Thomas, and Edward Colless. Cambridge, MA: LEA / MIT Press, 2017. By its very nature, chemistry is a science of transformation; reactions begin with known materials and end with tangible products; yet, for chemists, it is often the non-isolable molecular species produced during this journey between stable endpoints that are particularly fascinating. These immaterial, unstable states can only be imagined through drawn or rendered molecular illustrations. My focus here is on how chemists map chemical instability onto the legible domain of molecular representations and the associated temporal aesthetics of such representations. There is the knowable, there is the unknowable, and there is the unknowable unknowable; chemists explore this trinity of epistemological domains. We can smell, feel, and see liquids, solids, and gases, but the atoms and molecules that make up these phase states are intangible, experienced only indirectly through their experimental properties. Yet, even in the unknowable atomic realm, a continuum of unknowability exists, ranging from stable ground-state molecules that we store in jars indefinitely to fleeting, high-energy reaction intermediates and transition states that perch for femtoseconds on the borders of infinitesimal timeframes. Molecular structures—the lingua franca of chemistry—appear to occlude temporal distinctions; stable or short-lived, we use the same conventions to visually represent these species. Nevertheless, the aesthetics associated with stable and transient molecular forms remain distinct. In Butlerov’s Vision: The Timeless, The Transient and the Representation of Chemical Structure, Stephen Weininger tells of late nineteenth century scientists’ focus on chemical structure, and shows how this led to an “abridgement of the scope of thinking about chemical dynamics” and ultimately “to the relegation of time to a subordinate status within chemical thought.”  More than a century later, structure, energy, and reactivity (the latter being the direct manifestation of the relation between structure and energy) still preoccupy most chemists. Weininger’s story of the shifting positions of time and space during the delineation of disciplines within chemistry explains why the focus of molecular aesthetics has been on structure and, more specifically, on representations of stable, relatively long-lived molecules; yet molecular representations, which map structure, always implicitly encode energy and reactivity. In part because molecular representations are overtly structural, previous aesthetic analyses of molecular representations, whether based on Plato’s, Eco’s, or machine aesthetics, are undergirded by a formalist perspective. In my current work, I've shifted focus from molecular aesthetics to transient molecular systems, and concurrently have moved away from the formal and structural aesthetics typically associated with stable molecular forms. I propose to develop instead a temporal aesthetics that provides a different paradigm by which we may more attentively observe the elusive systems that animate the borders of molecular representation. Figure 1. Tami I. Spector, Potential energy diagram for a SN2 reaction. © Tami I. Spector, 2016. Courtesy of the artist. Developed in the late nineteenth and early twentieth centuries, transition state theory equates experimentally determined reaction rates with the activation energy (Ea) of a reaction (the height of the energy barrier needed for a reaction to proceed from starting materials to products) (figure 1). In the 1930s, Henry Eyring and Michael Polanyi visually extended the underlying mathematics of transition state theory when they created representations of potential energy surfaces. Potential energy surfaces correlate the multiple mechanistic paths a reaction can potentially take with energy on a 3-D surface, and call attention to the lowest energy path the reaction can take. This lowest energy path is the 2-D representation we visualize as a potential energy diagram. 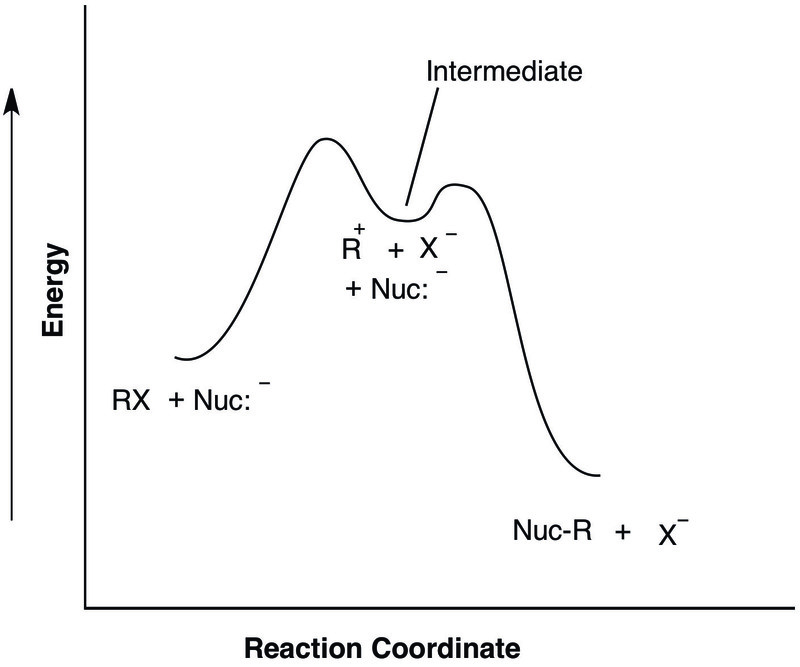 Figure 1 depicts the potential energy diagram for a SN2 (substitution nucleophilic bimolecular) reaction, one of the first reactions that undergraduate students learn in organic chemistry. The most important point on this diagram (with the exception of the “ground state” starting materials and products of the reaction) is the transition state structure; that is, the structure associated with the highest energy along the path (at the top of the hill drawn in brackets). In actuality, transition state structures are notional imaginings of what the structure looks like at this point in the reaction. Unlike stable starting materials and products, transition states cannot be chemically isolated, and therefore even their experimental traces elude us. As I aim to develop a temporal molecular aesthetics for elusive molecular species such as transition states, and given that the Cartesian coordinates of a potential energy diagram do not include units of time (as exemplified by figure 1), why do I discuss such diagrams at all? And, what does Weininger mean when he writes that such diagrams allow chemists “to visualize time itself”? We better understand Weininger’s claim when we actually parse the diagram. To begin, though the reaction coordinate (x-axis) is not depicted in units of time, it does present the spatial relationships between molecular objects as the reaction proceeds from left to right, and each of these objects implicitly represents a temporal instant. The eye can only traverse space by means of the intuition of time, and thus when mapping energy, we cannot avoid an indication of temporal progression. Moreover, potential energy diagrams also encode visual narratives that proceed along the reaction coordinate. These narratives tell different stories (that is, they depict different chemical systems), but, almost without exception, they rely on the same plot structure from the beginning of the story (the starting material) to the denouement (the declension into product). The transition state thus forms the climactic point in the narrative, a fugitive moment of transformation from one state to another. The diagram shown in figure 1 tells the story of a SN2 reaction, but it could also narrate nearly any other molecular process, from the homolytic bond cleavage of the smallest hydrogen molecule (H2) to the folding of a massive protein. Lastly, then, though reactions occur within varied timeframe—from seconds to days to years—evanescent transition states have a known experimental lifetime on the femtosecond (10-15 second) timescale. A chemist’s knowledge of this timeframe, therefore, explicitly bestows a sense of time onto potential energy diagrams. 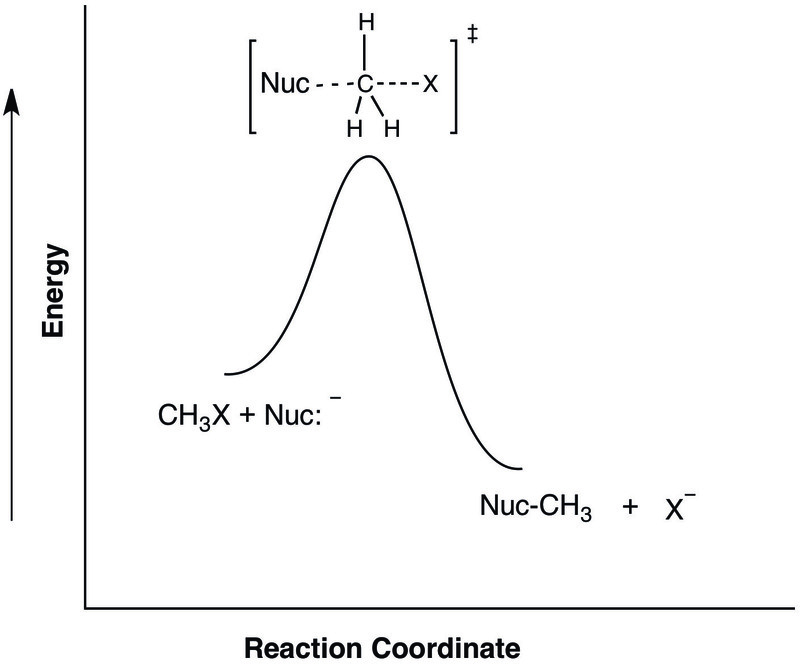 In addition to transition states, which can be inferred for all reactions, some reactions have multiple transient species along the reaction path that similarly assert time onto potential energy diagrams. 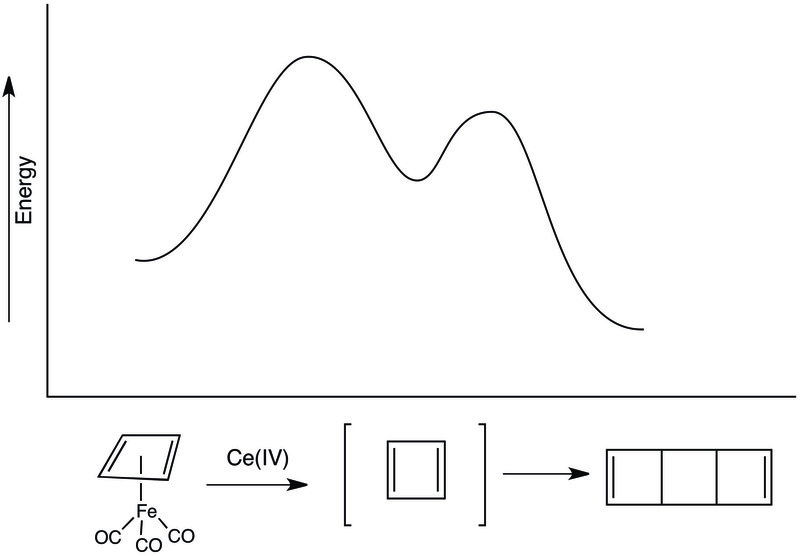 As illustrated in figure 2, these species are also high-energy, but correspond to a relative minimum on the reaction path (a dip in the energy profile). Chemists define these additional species as intermediates and note that they invert energy and time relative to transition state; having somewhat lower energy than a transition state, intermediates have correspondingly longer lifetimes (from 10-10 to 10-6 seconds). Figure 2. Tami I. Spector, Potential energy diagram for a reaction (SN1) that includes an intermediate. © Tami I. Spector, 2016. Courtesy of the artist. The string, like a potential energy diagram, is intelligible because it can be segmented. However, when wound into a ball, the string becomes “a stabilized object” from which we derive an ironic byproduct: time no longer as the diachronic passage of clock-time, but as synchronic and kinetic. The way in which a static image like a ball of string or an energy diagram captures the “emergence of stabilized objects” is illuminated by Robin Le Poidevin’s concept of “specious instants,” a term that captures the imperceptibility of actual instants. He defines a specious instant by what we can temporally perceive in static images: “a time slice of the action” with a “non-zero duration,” the smallest perceivable part of an instant. For molecular scientists, depictions of high-energy, thermodynamically unstable, species-like transition states and intermediates, whose time frames of existence are “specious instants” that express the spatial imperceptibility of time, hold a particular aesthetic fascination. Figure 3. Depiction of the ultrafast dynamics of stilbene cis/trans isomerization. Bottom: time snapshot; Middle: PES; Top right: transition state structure. Figure 6 from Polanyi and Zewail 1995, 126. © American Chemical Society, 1995. Used with permission. Figure 4. Tami I. Spector, Cis/trans isomerization of stilbene. © Tami I. Spector, 2016. Courtesy of the artist. The aesthetic attraction of transient chemical species is lyrically encapsulated by Nobel laureates John C. Polanyi and Ahmed H. Zewail’s statement that “the transition state is neither one thing, namely, chemical reagents, nor the other, reaction products. Instead it illustrates the mystical event of trans-substantiation” (my emphasis). In Polanyi and Zewail’s paper, “Direct Observation of the Transition State,” the depiction of the ultrafast dynamics of stilbene cis/trans isomerization (figure 3) reveals how the “specious instant,” illustrated in such representations, accounts for the aesthetic associations expressed in their theological metaphor. In order to understand these associations, we must first consider what transubstantiation represents scientifically, including the fact that the reaction they examine in the referenced experiment transforms the cis isomer into its trans isomer through a “twisted” transition state (figure 4). The caption accompanying figure 3 in the original paper reads: Bottom: Experimental observation of the twisting (decay) and resonance (oscillation) motions depicted on the PES (middle). The trajectory shown on the PES describes the changes in the molecular structure, and three snapshots at different times display the corresponding structures.”  Nonspecialists will not find this caption illuminating. To clarify, the bottom image provides the experimental data; specifically, the changing amplitude of electromagnetic radiation absorbed by the molecule’s double bond over the course of the femtoseconds it takes for the cis isomer to convert into the transisomer. We can define the bottom image as a time snapshot that provides the data for the middle-right image, which maps the potential energy surface for the absorbances throughout isomerization against the dihedral angle for the bond twist. The middle-left and uppermost images, then, map imaginal structures at various points within this timeframe (to, t1, and tf) onto the potential energy surface. The structure at t1 represents the transition state and its juxtaposition with the potential energy surface, and the time snapshot explicitly links its static image to time. Like Blake’s golden thread, when wound into a ball, the transition state structure mystically transubstantiates space into time. This explanation provides a parsing of the way in which Polanyi and Zewail’s isomerization manifests itself in time. But what explicit aesthetic qualities do chemists reference when they link images of transition states to a timeframe? Do representations of transition states simply freeze a moment in time, an event that in the sublunary sphere can only ever be imaginary? Clearly, this does not account for the depth of the aesthetic response to such representations. Only a systematic, deductive analysis can measure the ecstatic response to depictions of elusive molecular species as described by Polanyi and Zewail. We could begin such an analysis with the following considerations. First, molecules are visually imperceptible, and therefore any resemblance of their representations to their material state is wholly adventitious. Second, representations of molecules express the visually imperceptible properties of molecules. As I and others have demonstrated, these representations have aesthetic qualities. Third, the correlation of the structure of a transition state with a specific high-energy point on an energy diagram extrapolates the visually imperceptible properties of molecules into the domain of time, a dynamic, imaginary apprehension that goes beyond mere cognition. It follows, then, that static representations of visually imperceptible transition states coalesce the aesthetics of static molecular representations with the equally imperceptible aesthetic aspects of time, including the qualities of duration, dynamics, and sequence. Figure 5. Tami I. Spector, Cyclobutadiene (in brackets) formed as an intermediate in the reaction of cyclobutadiene iron tricarbonyl (starting material) with cesium (IV) to form cyclobutadiene dimer (product). © Tami I. Spector, 2016. Courtesy of the artist. In a quite different, but equally aesthetical, moment, Nobel laureate Donald Cram spoke of cyclobutadiene (CH)4, as “the Mona Lisa of organic chemistry in its ability to elicit wonder, stimulate the imagination, and challenge interpretive instincts. No other organic compound combines such a fleeting existence and so many different syntheses with such a propensity for different chemical reactions, and with the variety of calculations of its structure.”  Underlying this essentially hypostatic insight is cyclobutadiene’s anti-aromaticity, which causes it to be utterly unstable. 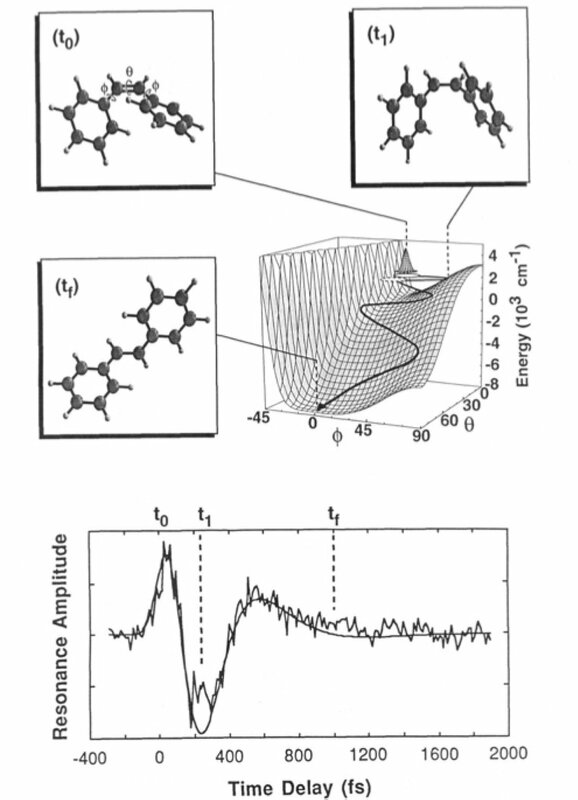 As shown in figure 5, cyclobutadiene corresponds to a high-energy dip in the potential energy diagram and is therefore defined as an intermediate. Here, and in the example of the transition state illustrated in figure 1, the ephemeral lifetime of cyclobutadiene represented on the reaction path explicitly represents time. As I have discussed, energy diagrams moor molecular representations of transition states and intermediates to time and depict the interdependence of spatial and temporal intuitions; however, molecular representations outside the context of energy diagrams also reveal the tethering of space to time, if less directly. Thus, depictions of cyclobutadiene alone also elicit delight. Cram’s wondrous description of cyclobutadiene makes this clear, comparing this high-energy molecule with the Mona Lisa. The reputation of Leonardo’s portrait is based, at least in part, on some remarkable comments made by the late nineteenth century art critic Walter Pater. Writing on his own proposed link between a historical figure and Leonardo’s representation of her, Pater posits, “it is a beauty wrought out from within upon the flesh, the deposit, little cell by cell, of strange thoughts and fantastic reveries and exquisite passions.”  Arguably, these comments are less about the painting than about the woman portrayed in the painting, around which he created a myth that contains echoes of Polanyi and Zewail’s “mystical transubstantiation.” The transition state described by Polanyi and Zewail, as well as Cram’s cyclobutadiene, possess a beauty created by deposits of femtoseconds and atoms “wrought out from within” by the transubstantiation of reaction sequences. For chemists, the structures of cyclobutadiene and other transient species fill us with an almost theological awe. For chemists, static, isolated images of transient molecular species such as cyclobutadiene carry just such a narrative function because they exist only momentarily on the path from one stable species to another. As a result, we know what comes before and what comes after the “snapshot.” Depictions of elusive molecular species provide “a frozen scene in a tacit action sequence.”  Compressed into single structures, they spatialize the specious instant between reactants and products, capture the transient sensation of sublimity, and simultaneously encode the aesthetically rich concepts of emergence and decay, construction and dissipation. Though sometimes misapprehended as generating images of actual atoms/molecules, Scanning Probe Microscopy (SPM) technologies in fact depict contour maps of atomic/molecular electron “cloud” densities. Stephen J. Weininger, “Butlerov’s Vision: The Timeless, the Transient, and the Representation of Chemical Structure,” Of Minds and Molecules, ed. Nalini Bhushan and Stuart Rosenfeld (Oxford: Oxford University Press, 2000), 146. Joachim Schummer, “Aesthetics of Chemical Products,” HYLE: International Journal for Philosophy of Chemistry 9 (2003): 73-104. Tami I. Spector, “Nanoaesthetics: From the Molecular to the Machine,” Representations 117 (2012): 1-29. Stephen Weininger, “Butlerov’s Vision,” 153. Henry Eyring and Michael Polanyi, “Uber Einfache Gasreaktionen,” Zeitschrift fur Physikalische Chemie B, 12 (1931): 279-311. Nathanael Lawrence, “Time Represented as Space,” in Basic Issues in the Philosophy of Time, ed. Eugene Freeman and Wilfrid Sellers (La Salle: Open Court, 1971), 128. William Blake, The Complete Poetry and Prose of William Blake, ed. David V. Erdman (Garden City: Anchor Books, 1982), 231. Robin Le Poidevin, “Time and the Static Image,” Philosophy 72 (1997): 186. John C. Polanyi and Ahmed H. Zewail, “Direct Observation of the Transition State,” Accounts of Chemical Research 28 (1995): 119. The dihedral angles are defined as the angle between the two planes defined by Ph-C=C-Ph (figure 4) as the isomerization occurs. I cannot fully elaborate these considerations and their implications within the scope of this essay. See for example, Roald Hoffmann, “Molecular Beauty,” The Journal of Aesthetics and Art Criticism 48 (1990): 191-204; Joachim Schummer, “Aesthetics of Chemical Products”; and Tami I. Spector, “The Aesthetics of Molecular Forms,” in Molecular Aesthetics, ed. Peter Weibel and Ljiljana Fruk (Karlsruhe: ZKM| Center for Art and Media and Cambridge: The MIT Press, 2013), 196-211. Donald J Cram, Martin E. Tanner, and Robert Thomas, “The Taming of Cyclobutadiene,” Angewandte Chemie International Edition 30 (1991): 1024. Antiaromaticity is an extremely unstable, high energy, electron configuration associated with cyclic carbon molecules possessing alternating double/single bonds with 4n electrons (n = any integer) in the double bond system. Walter Pater, The Renaissance: Studies in Art and Poetry: the 1893 Text, ed. Donald Hill (Berkeley: University of California Press, 1980), 98-99. Piet Mondrian, “Plastic Art and Pure Plastic Art,” The New Art – The New Life: The Collected Writings of Piet Mondrian,” ed. Harry Holtzman and Martin S. James (Boston: G. K. Hall & Co., 1986), 294. The Edgerton Digital Collections (EDC) Project, “Iconic Photographs: Bullet Through Apple - 1964,” http://edgerton-digital-collections.org/ (accessed September 23, 2014). Michael Ranta, “Narrativity and Time in Static Pictures: An Approach Influenced by Categorization Research within Cognitive Psychology,” Proceedings of the XVth International Congress of Aesthetics, Tokyo (2002): 345. Tami Spector is a professor of organic chemistry at the University of San Francisco. Trained as a physical organic chemist, her scientific work has focused on fluorocarbons, strained ring organics, and the molecular dynamics and free energy calculations of biomolecules. She also has a strong interest in aesthetics and has published and presented work on molecular and nano-aesthetics, the visual image of chemistry, and the relationship between chemistry and contemporary visual art. She is on the governing and editorial boards of Leonardo/ISAST, cohosts the San Francisco-based Leonardo Arts Sciences Evening Rendezvous' (LASERs), and serves as the coeditor of an ongoing special section, “Art and Atoms,” for the Leonardo journal.